Noramco offers a flexible high-containment suite with controls in place to produce compounds of OEL<500 ng/m3 and systems in place to create NSP-grade APIs for parenteral applications. 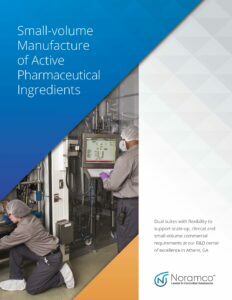 Special adaptations in suite design, equipment design, operations and process safety afford developers a one-stop location to produce on an R&D scale, then advance through clinical stages and finally to commercial production of small-volume APIs. Noramco reduces your time to market with a customer-focused, knowledgeable regulatory affairs team to supply comprehensive documentation, from IND support to commercial filings.